Like a thick fog, the stench of death curdles the air in the streets of this shattered city. It comes from trundling trucks, where corpses are piled up and covered by bloodstained sheets, while young men with scarves on their faces warn onlookers to stand aside. It is expelled from pyres of burning tires that incinerate cadavers that have remained unattended too long in the dust and heat, lit by residents afraid that the carrion will attract prowling dogs and endanger children. And it surges through piles of rocks and rubble, where hospitals, schools, palaces and homes fell like cards as the ground shook with the fiercest earthquake to strike this island in two centuries. No one can tell how many have perished, and the exact number of dead will be almost certainly never be known. Thousands? Tens of thousands? Hundreds of thousands? The panorama of destruction appears endless. Street to street, neighborhood to neighborhood, ever more shattered buildings, wounded survivors and decaying corpses can be found. In one alley, two bodies lie across from a group of teenagers sitting and chatting. Around the corner, dozens of cadavers are piled in the remnants of a government building that reportedly had 1,000 employees. 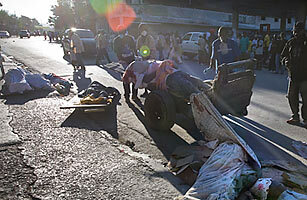 Photographer Shaul Schwarz, on assignment for TIME, saw corpses piled on the street impeding traffic. While there was certainly anger and frustration, the atmosphere is mainly calm, considering the scale of the catastrophe. Most of the city has no electricity, gasoline, phone lines, drinking water or working shops. But residents are clearing away the debris from outside their homes. At many of the large ruined buildings, groups of men work slowly taking apart the rubble with sledgehammers and chisels. They clear away the dead and search for the living. At a children's hospital, men search for the director who was in his first-floor office when five levels tumbled down. "We will get him out soon," says Pierre Josef, resting after swinging a hammer through the crumbling concrete. But the calm is not everywhere. On one street, dozens of men and teenagers storm into the collapsed building of a cellular-phone company, pushing and shoving over the spoils. As an expensive pickup truck drives fast through the crowd, some men shout and throw stones, cracking its window. The poorest country in the western hemisphere, Haiti is also a land of great inequality and social tensions rumble beneath the surface. But in the time of such catastrophe, it is more often solidarity that shines through rather than social grievances. Both rich and poor have been hammered by the earthquake. Like a nightmarish lottery, the tremor seemed to have picked out houses at random, devastating one building and sparing the next. An impervious-looking hotel has tumbled to the ground, while next to it a fragile-looking Catholic church stands tall. Most of those who escaped the collapsing buildings suffer on the streets. Miriam Rosseate, a 22-year-old student with a leg crushed by her falling house, bites her fist to fight the pain. She went for two days without medicine and when she was finally given an injection it didn't seem to help much. "I can't think of much except how much it hurts," she says, wincing. Other entire families struggle in tents made of sheets and twigs. Jean Manol, a 34-year-old tennis instructor, had both his home and the hotel he worked in destroyed. "We just have to keep fighting. This will pass," he says, sitting in a makeshift tent with his wife and two small children. Such make-do refugee camps sprawl across soccer fields, sidewalks and the middle of entire streets. Others have decided to leave the city completely. Rickety buses and trucks move in triple file carrying families, suitcases and even furniture. Some worry about disease. Some fear there could be a tsunami after the quake, a rumor that rippled through the street like water. Others just feel the countryside will offer them more safety. "There is nothing for us anymore," says a somber woman, carrying her baby in her arms as she climbs on a truck. "This city will never be the same again." Read "Haiti: Freedom and the Devil's Pact?" Next Will Criminal Gangs Take Control in Haiti's Chaos?